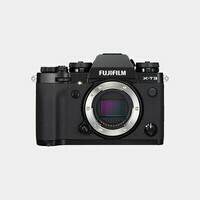 Offering a more conventional form factor and packing in UHD 4K video recording, Fujifilm's X-T2 Mirrorless Digital Camera aims to fill the needs of many working professionals. Equipped with a 24.3MP APS-C X-Trans CMOS III image sensor and the X-Processor Pro Engine, users will be able to capture finely detailed imagery quickly and with low noise at sensitivities up to ISO 51200. The powerful combination permits rapid image capture at up to 8 fps with full AF tracking or at up to 14 fps using the silent electronic shutter. In terms of AF, the X-T2 uses an Intelligent Hybrid system with 325 points that ensure accurate, fast tracking of subjects in all modes.